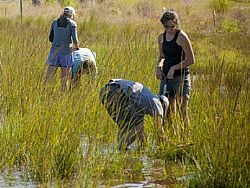 What is blue carbon, and how can coastal wetland restoration support sustainability goals? This workshop is for regional planning council members, sustainability coordinators, economic developers, urban planners, NGOs, resource managers, etc. Workshop sponsors include: National Estuarine Research Reserve System Science Collaborative, Restore America’s Estuaries, Tampa Bay Regional Planning Council, Tampa Bay Estuary Program and Rookery Bay National Estuarine Research Reserve. For questions related to this workshop, please contact Stefanie Simpson.